My lovely went to the snowball dance last night and she looked so pretty with curly pink hair and little jewels by her eyes that I couldn't resist making a colorful montage of her wonderful face. Isn't she just the cutest thing ever? A living doll. She is super cute, Kelli ... a living doll. I like that! What did you use to make the montage, that's really nifty. Looking forward to seeing you a couple of weeks!!! She looks great in all colourways! 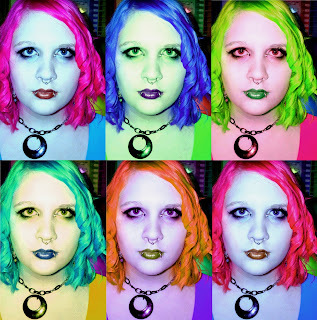 I've tried to do a kind of Warhol thing with my own photo - but with considerable less success!